Take a break from the hustle and bustle of city life with 10 short getaways only two hours away from Brisbane. The destinations range from a relaxing day coupled with fine dining and a view to fun-filled outdoor activities. 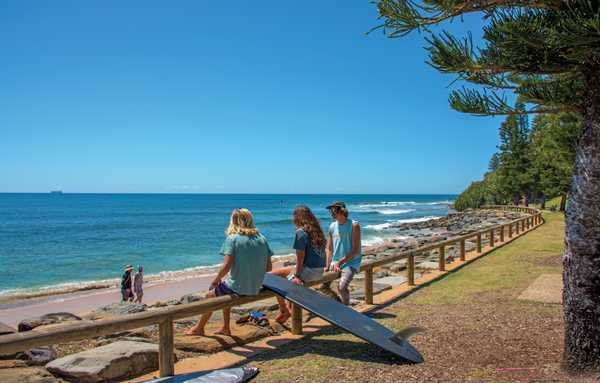 Caloundra: Walk the 8km headland trail from Golden Beach to Dickey Beach, feed the pelicans at Pumicestone Passage, cruise, paddle or jetski down the Pumicetone Passage, meander through the markets on a sunday, try Surfing at the Caloundra Surf School, visit the war museum. Surfers Paradise: Always, famous for fun, this is now the top spot to go resort hopping: Start at the re-engineered Sheraton Mirage, pop into the Hilton for a cocktail, dine surf side at Hurricane Grill, zip over to the Marriott for all you can eat dessert and then head to Stingray at the QT hotel for cocktails. You never have to drop a star. Brisbane's back yard: Zip up to Birches Restaurant at Mt Mee or Oceans View Restaurant and Vineyard for a country lunch with megawatt views. (If you are keen, you can even hire a horse and ride to Oceans View.) Stay the night at Mercure Clear Mountain Lodge and wake up to one of the most glorious views over Samford Valley. The Scenic Rim: Hike to the Governors Chair and hit the old Cobb & Co trail, then celebrate with a beer at the historic Dugandan Hotel. If you are staying overnight, then camp by Lake Moogerah or glamp at Spicers Canopy. Toowoomba: Explore Toowoomba, an elevated mountain city with glorious parks and gardens. Toowoomba's history screams from its architecture, spearheaded by the beautiful art deco Empire Theatre and the City Hall and Clock Tower. Park your head on a pillow in one of the heritage B&Bs while enjoying the sound of a real fire crackling in the background. Get your 'vintage' on with a few hours of antique and op-shopping and don't forget a walk down Russel 'Heritage' Street which leads you past landmarks of fine historic architecture dating back to the 1860s. North Stradbroke Island: Refreshing, relaxing, and simply beautiful, North Stradbroke Island, or "Straddie", as the locals call it, is one of Moreton Bay's best loved getaway spots. Stretches of white sandy beach line the island's ocean side making it ideal for swimming, surfing, and fishing. Sunshine Coast Hinterland: West of the Bruce Highway, the Blackall Range Montville, Maleny and the other villages that perch on or behind the escarpment have restaurants, wineries, alternative-style eateries and produce stores, art galleries, boutiques and curiosity shops catering for tastes refined or earthy. Lake Wivenhoe: Holding twice as much water as Sydney Harbour, Lake Wivenhoe is the sweet spot for fishermen, boat enthusiasts and campers. The nearby village of Fernvale is well known for its colourful Sunday markets and folks as far afield as Brisbane and Ipswich travel there just to snap up a bargain. Noosa North Shore: Across the river from Noosa Heads and Noosaville is Noosa North Shore, a long stretch of white sand, dunes and beautiful coastline, and the gateway to World Heritage-listed Fraser Island and Great Sandy National Park. A quick and convenient car ferry operates 7 days a week from Tewantin to showcase the region's unspoilt nature to perfection. Try horse riding, four wheel driving, swimming, fishing and surfing or go kayaking on Lake Cooroibah. Gold Coast Hinterland/Mt Tamborine: Swap the hustle bustle of Surfers for the rolling hills of the hinterland, home to bushwalks, rainforests, wineries, breweries, restaurants and health retreats. Surrounded by the Springbrook National Park and Lamington National Park this is nature at it's best. If you're looking for a little recharge, stay at one of the region's many health retreats including O'Reilly's, Camp Eden, Songbirds, Golden Door and Gwinganna. The Fact Sheet is supplied courtesy of Tourism and Events Queensland. For more information, please go to www.queensland.com or www.blog.queensland.com. For images, please visit http://trq.lookat.me.com.au/.